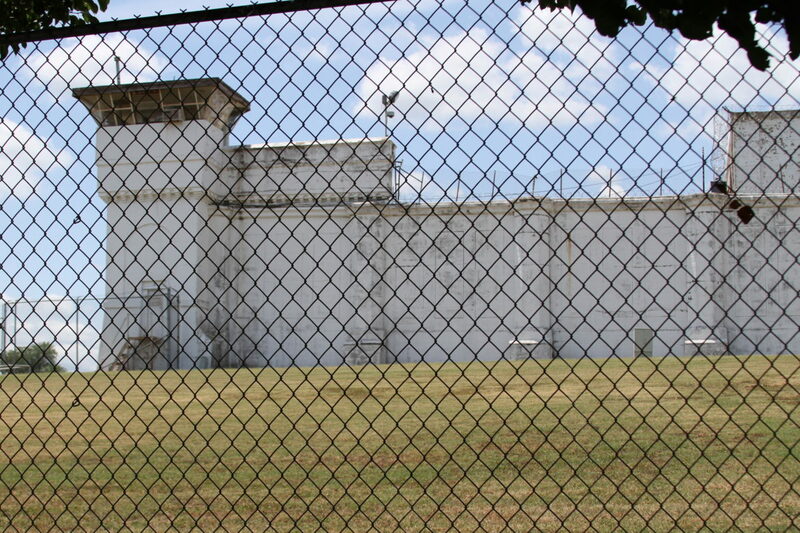 The Oklahoma State Penitentiary in McAlester. Criminal justice measures approved by Oklahoma voters in November took effect July 1, testing predictions that fewer people will go to prison and taxpayers will ultimately save millions of dollars. But even before those laws kicked in, questions swirled as to whether they will be undermined in part by local prosecutors or a lack of funds and won’t fully achieve their stated purpose. Even if they succeed – by keeping thousands of nonviolent offenders from becoming felons – advocates for change acknowledge it won’t be enough to halt the state’s rising tide of incarceration. Despite passage of State Questions 780 and 781 last year, “this (incarceration) growth is expected to continue, costing the state over $1.9 billion in the next 10 years unless further changes are made,” said a study by the Oklahoma Justice Reform Task Force, assembled by Gov. Mary Fallin. SQ 780 will make simple possession of any drug and certain property crimes misdemeanors, with the goal of imprisoning fewer people. SQ 781 will use any savings from that reduction to fund mental-health and substance-abuse treatment programs. To expand the effort, as the task force recommended, a dozen additional bills aimed at reducing incarceration were introduced in the last legislative session. Only three passed. The most consequential ones were bottled up in a House conference committee. 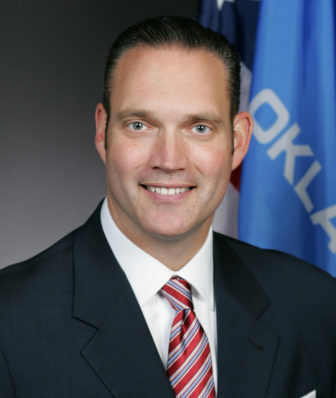 Accusations flew between Rep. Scott Biggs, R-Chickasha, committee chairman, and Fallin and other supporters of the bills. The result is that after five years of intensive, bipartisan advocacy for change in Oklahoma’s criminal justice system, a sweeping overhaul hangs in the balance. One thing is clear: Simple possession of drugs, including repeat offenses, will no longer be a felony after July 1. The effect the downgrade will have is murkier. Some observers warn that district attorneys could circumvent the law by charging more people with possession of drugs with intent to distribute – a felony even in cases with a small amount of drugs. It is based on the circumstances surrounding the arrest, such as the presence of scales or other paraphernalia, that indicate the person intended to sell or share the drugs. “If that number rises markedly, it may be evidence that prosecutors are changing their strategy in order to keep charging felonies to drug offenders,” said Ryan Gentzler, an analyst for the Oklahoma Policy Institute, a left-leaning research group. If prosecutors defer to the new laws, the number of misdemeanor drug possession filings could spike. Some county sheriffs and district attorneys say growth in these prosecutions could put a strain on counties because misdemeanor offenses only carry fines and time in county jails, not prison sentences. Gentzler predicted “obstacles” during the first year as the justice system adapts. “There will be an increase in the demand for treatment, and perhaps more people will be sentenced to short jail terms in lieu of prison sentences if that treatment isn’t available,” he said. Opponents argue that the state is moving too fast with changes, a shortage of funds exists and public safety could be jeopardized. SQ 781 is supposed to help pay for increased substance abuse and mental health treatment, but it will be at least a year before it generates any money – and the amount of money is unclear. The Office of Management and Enterprise Services is required to make an annual estimate of the amount of money saved from reduced incarceration. The Legislature then must place the money in a special account and disperse it to counties based on population. The agency isn’t required to report its first estimate until July 31, 2018, and is developing its methodology for tracking savings, but it’s too early to know how it will look, spokesman Michael Baker said. 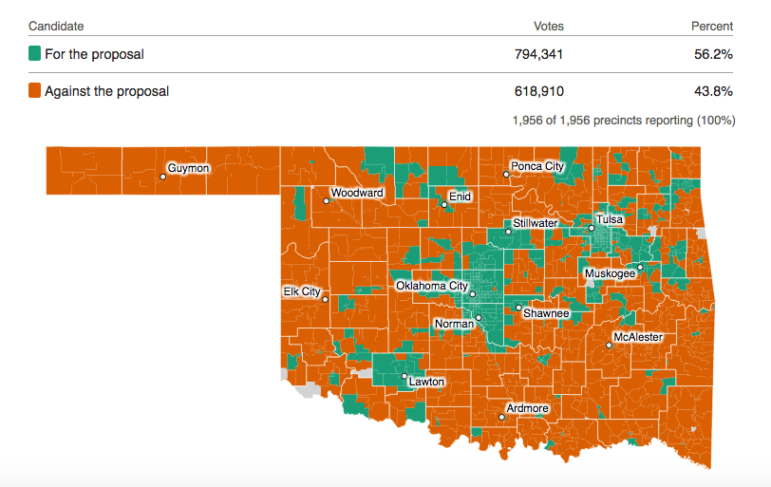 Using historical counts of inmates serving crimes that are covered by State Questions 780 and 781 and the daily per-person cost of incarceration ($32 to $52), Oklahoma Policy Institute estimated that SQ 781 would save taxpayers $45 million over six years. However, such estimates could prove inaccurate because they are based on assumptions about prosecutors’ decisions and the number of future offenders. In California, voters passed similar reforms in 2014, yet estimates of annual net savings have been $100 million to $200 million lower than originally projected. Texas, however, implemented programs such as diversion, intermediate sanctions and drug treatment and, according to some estimates, saved $3 billion, in large part because it avoided building new prisons and closed three of them. 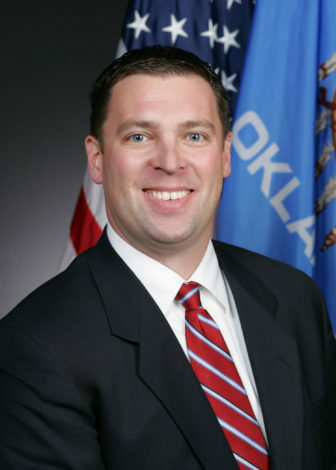 Former House Speaker Kris Steele, who led the effort for changes, predicted a roughly 3,200-person decrease in the number of prisoners over the next 10 years as a result of the state questions. Yet even with the softened penalties, the prison population still is expected to grow by more than 7,000 people over the next decade, he said. As of June 26, Oklahoma had 28,247 incarcerated inmates and others awaiting transfer to prisons from jails, the state Corrections Department reported. “Ultimately, we would see savings by avoiding to have to invest in additional prisons,” Steele said. In February, after meeting for six months, Fallin’s Oklahoma Justice Reform Task Force issued a report with 27 recommendations aimed at reducing the state’s prison population and saving money. Parts of the study echoed recommendations made by an Oklahoma City Chamber criminal justice task force in a December 2016 report. Between the two groups, the members and “endorsers” included some of the state’s top business, political, civic, nonprofit and criminal justice leaders and groups: the conservative Oklahoma Council of Public Affairs, Corrections Director Joe Allbaugh, Baptist General Convention of Oklahoma President Hance Dilbeck, former Gov. Brad Henry, and business leaders Clayton Bennett, Larry Nichols, Harold Hamm, Tom Ward and Gene Rainbolt, among others. But that lineup didn’t clear a path at the Capitol. Of the dozen bills recommended by Fallin’s task force, three passed and were signed into law. Eight didn’t make it out of Biggs’ conference committee but can be considered next year. One is dead. The four bills that Biggs opposed the most – Senate bills 649 and 689 and House Bills 2281 and 2286 – would have, among other things, reduced sentences for certain crimes for first-time and repeat offenders; raised the threshold for grand larceny from $500 to $1,000, and reduced the amount of time some offenders must serve before becoming eligible for parole or expungement. Biggs said he would have been willing to negotiate on bills in his committee, but no one reached out to him directly. Advocates instead used press releases and social media, he said. “The governor, for all she claimed to be for this package, never once talked to me about these bills,” Biggs said. In an interview, Fallin said her staff met with Biggs repeatedly over months, including in mid-May. She said she doesn’t necessarily contact individual legislators about bills, but her staff is in regular discussions with them. “There was a tremendous amount of interaction between our office and Representative Biggs,” she said. Fallin said she also asked House Speaker Charles McCall “probably close to five times” to reassign criminal justice bills away from Biggs’ conference committee, but McCall was noncommittal. “Even up until probably the last two nights before session was over, I was still asking them to at least give it to the floor and just have a vote,” Fallin said. McCall and Biggs’ inaction left the bills’ supporters dumbfounded. They questioned how a single state representative could block changes that the House and Senate had already voted to approve in some form and that most voters likely supported, given their approval of state questions. Steele, who runs an Oklahoma City nonprofit that works with ex-offenders, said he tried to meet with McCall and Biggs, but Biggs never responded and McCall’s office said he was too busy. McCall “is responsible for the demise of the bills this session,” Steele said. Steele added that Biggs and other skeptical lawmakers were afraid of being seen as soft on crime and were swayed by district attorneys’ arguments. Rep. Greg Babinec, R-Cushing, who served on Biggs’ committees and sponsored a bill to allow medically frail inmates to be released, said McCall asked him to help keep the reform bills alive but otherwise didn’t intervene or discuss them. “I think the speaker wants to see them enacted. … I fully expect for these bills to be alive and be presented on the floor next session,” Babinec said. McCall, R-Atoka, hasn’t said anything publicly about his involvement in the bills’ final days. His spokesman said he was out of state and unable to comment. In a June 2 press release, McCall did announce an interim study on criminal justice reform to be held later this year. Fallin said she is willing to wait another year if that’s what it takes, but questions whether the interim study will add much to understanding the issue. Biggs denied that he was motivated by political aspirations. The bills weren’t victim-friendly, he said, and as a former prosecutor, he couldn’t go along with them. “We need to be diligent and we need to fix the issues with the bills before we pass them,” he said. The bills’ chances of passage next year will be complicated by the fact that election campaigning will be in full force. One possible factor in the failure of justice bills to advance is a rural-urban gap. In the Nov. 8 election, State Question 780 passed with 58 percent of the vote; State Question 781 passed with 56 percent. However, a majority of voters in dozens of rural counties rejected the measures, sometimes with more than 60 percent against. 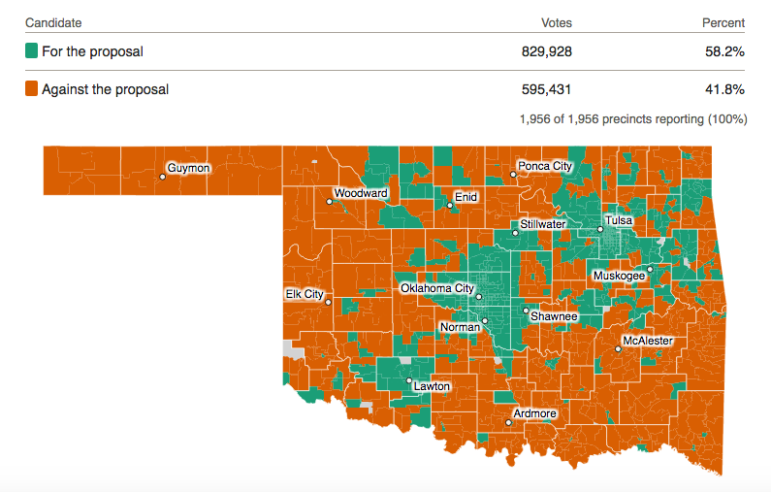 The Oklahoma City, Tulsa and Lawton areas voted heavily in favor. In Biggs’ and McCall’s House districts, both questions lost, election data shows. The divide suggests that tensions over criminal justice reform will persist in the next legislative session. 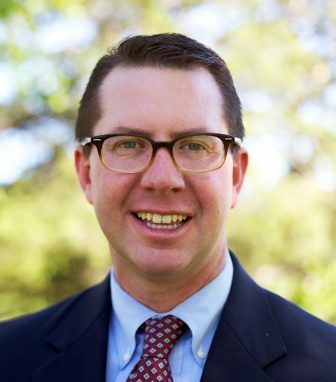 Reach Jeff Raymond at jraymond@oklahomawatch.org or (405) 325-2783.